Sun Chronicle Photograph of the dog park; Satchel Pooch (‘Get Fuzzy’ Character copyright by Darby Conley) added by Bob who had WAYYY too much time on his hands. One of the tremendous disadvantages of this being a WEEKLY newspaper is that we have to wait seven days for dog park updates. I find this very difficult, as every aspect of my entire life has become consumed by this all-important matter of the dog park. To fill the dog park information gap, here’s an update of what’s happened since we last talked. First up, I’ve done a great deal of research and pulled selectman meeting minutes going back to the founding of Foxboro (1620) and it’s incredibly suspicious that the dog park is not mentioned at all for over one hundred years. Why the cover up? What were the founding fathers of the town hiding? Were they holding secret dog park meetings in the 1600s? The only conclusion that a well-balanced, reasonable person would come to is emphatically YES. Back in the present: Could a battered economy, waning enthusiasm for the war in Iraq and President Bush’s low approval ratings spell trouble for Senator John McCain and other Republicans in November? According to a new poll, the answer depends on the dog park. Gas prices in Foxboro have topped $9 a gallon. 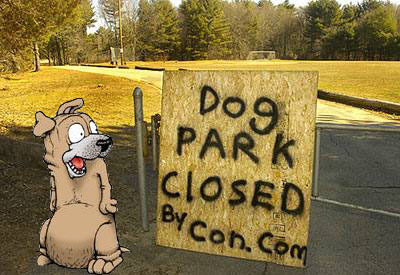 Despite no obvious connection, local residents have demanded that the dog park be closed. Incidentally, although the event received very little coverage locally (due to wall-to-wall dog park coverage), apparently the New England Patriots had a pretty good season (18-1), although they didn’t win the Super Bowl, due to the unstoppable Eli Manning, an incredible Giants offensive line, and Coach Belichick’s preoccupation with the dog park. This just in: People who live in towns with dog parks are 78.14% more likely to be happy than in towns that do not have dog parks. This just in: Dog parks have been shown to cause small children to spontaneously combust. The controversial findings were published in “Cat Fancy” magazine. The National Oceanic and Atmospheric Administration calls for a 90% probability of a near-normal or above-normal hurricane season for 2008. How this will affect the dog park is not yet clear. Stocks tumbled Tuesday as a troubling reading on the dog park underscored the drag of endless dog park stories on the local economy. The Dow Jones industrial average fell more than 100 points, or about the cost of 1000 bags of Kibbles and Bits. Billy Ray Cyrus says he wasn’t around when Annie Leibovitz photographed his 15-year-old daughter, Miley, wrapped in a sheet with her back exposed, for the June issue of Vanity Fair magazine. Despite no obvious connection, local residents have demanded that the dog park be closed. This just in — the best ways to reduce your carbon footprint are to drive a hybrid car, use less electricity, and support the dog park. Or not support it. Or something. When the dog park issue gets to the Supreme Court (and it will) I think Ruth Bader Ginsburg will be the swing vote. She just strikes me as a cat person. Finally, why is it that no one has ever interviewed a DOG about the dog park? It’s THEIR park. Seems they should have a say in all this. Stay tuned to this newspaper for complete dog park coverage (and nothing else) for at least the next decade (that’s 70 in dog years). Review: Bruce Springsteen and the E Street Band at East Rutherford New Jersey / Giants Stadium, July 28, 2008 → ← Silver Age Comic Books: Superman stops the LITTERBUG, Super-Kink, and the GLOP falls in love with Wonder-Girl!